The mayor was on hand Tuesday for the reopening of a modernized McDonald’s at Downtown Crossing. It is tempting to wonder why the mayor of a real, honest-to-God city like Boston would turn up at a ribbon-cutting for a local McDonald’s franchise. Under Marty Walsh, Boston is vying for Amazon’s new headquarters. The city spends a lot of energy fretting about whether we’re “world class” or “major league.” Walsh himself has become a national figure for taking on the president of the United States on immigration. A McDonald’s? And not even an opening, but a reopening? What is this, Boston, Indiana? But there was Walsh on Tuesday morning, Shamrock Shake in hand, cornered near the soda machines. “I heard the nuggets are great,” Walsh joked. And they were kind of great, fresh from the fryer, stuck through with frilly toothpicks and passed on silver trays like hors d’oeuvres. But hobnobbing at the Algonquin Club, this was not. If the image of the mayor of our metropolis chomping on chicken fingers and taking a swig of green milkshake is a little bit funny — and it is — it’s also worth noting that the city Walsh leads looks a lot more like the Downtown Crossing McDonald’s than it does any fancy fund-raiser or swanky soiree. More than one-quarter of Boston’s residents were born in other countries, like Carol Chin, who has owned the Downtown Crossing McDonald’s with her husband for seven years, and owns six others in the area. The Chinese-American couple’s Downtown Crossing restaurant is staffed by people who speak English, Spanish, Chinese, and more. And while the upgrades on display Tuesday included touch screen ordering and table service, it’s still the same McDonald’s most people know: inexpensive, consistent, weirdly satisfying, and (if you’re not very careful) pretty unhealthy. 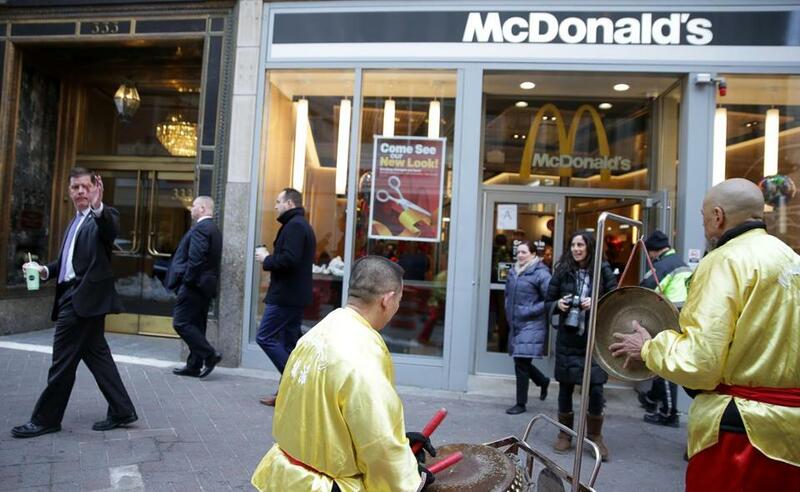 Boston Mayor Marty Walsh (left) in front of the McDonald’s. If you were trying to find the median meal in Boston, where something like half the population is still struggling to get by, it would probably be a lot closer to this than to L’Espalier. The vast majority of Bostonians may never set foot in one of the new glass-and-steel behemoths in the Seaport District, or the towers changing the skyline. But Big Macs, for better or worse, are available to anyone. A woman- and minority-owned business with a diverse staff and customer base, smack in the heart of a critical business redevelopment district? Frankly, that sounds like exactly the kind of place that people in power should be spending their time. So what if that business happens to serve McChicken sandwiches? 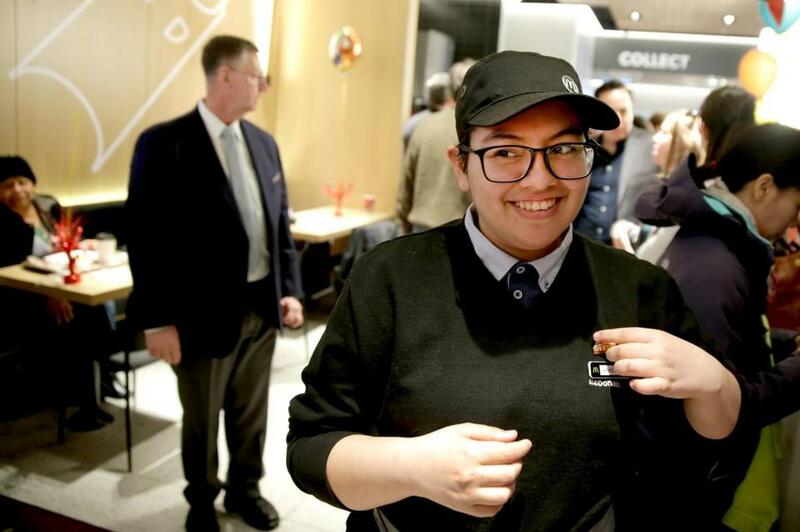 Janeliz Bonilla, 20, started working at the Downtown Crossing McDonald’s at the end of February. She helps people navigate the new touchscreen menus and brings food out to customers waiting at their tables. When the lines get too long, she takes orders at a traditional cash register. Janeliz Bonilla, 20, started working at the Downtown Crossing McDonald’s at the end of February. Bonilla lives with her grandmother in Everett after growing up all over the area — Boston, Brockton, Fall River, vocational high school in Easton. At home, she eats rice and beans and other food from her family’s Puerto Rican and Guatemalan traditions. She’d like to find a second job, she said, because she’s saving up for Roxbury Community College expenses, and wants to study to be a veterinarian’s assistant. On Tuesday, Bonilla helped customers, a few of whom expressed confusion about what was happening and who Walsh was, as they wandered around the crowded restaurant in search of an Egg McMuffin. At a podium in front of the new touchscreen menu kiosks, the Chins presented checks to two Boston public schools. In a nod to the Chins’ heritage, a Lion Dance team came tromping through the restaurant, dressed in traditional Chinese lion costumes and accompanied by cacophonous drums — a ceremony said to bring good luck. The lions, with two performers in each costume, paraded up to a platter full of Big Macs, fries, Chicken McNuggets, and heads of iceberg lettuce before hurling around and then trampling all the food. Walsh looked bemused; I was struck by a few pieces of flying lettuce — also good luck, according to one of the people in the lion costumes. Walsh, who didn’t order anything but ended up with some chicken fingers, said he couldn’t remember the last time he’d eaten McDonald’s, but knew it was fairly recently. “You’d be surprised,” he said, tracing his taste for the occasional Mickey-D’s meal to hamburger Wednesdays when he was a kid at St. Margaret’s school in Dorchester, when the school brought in McDonald’s for lunch. 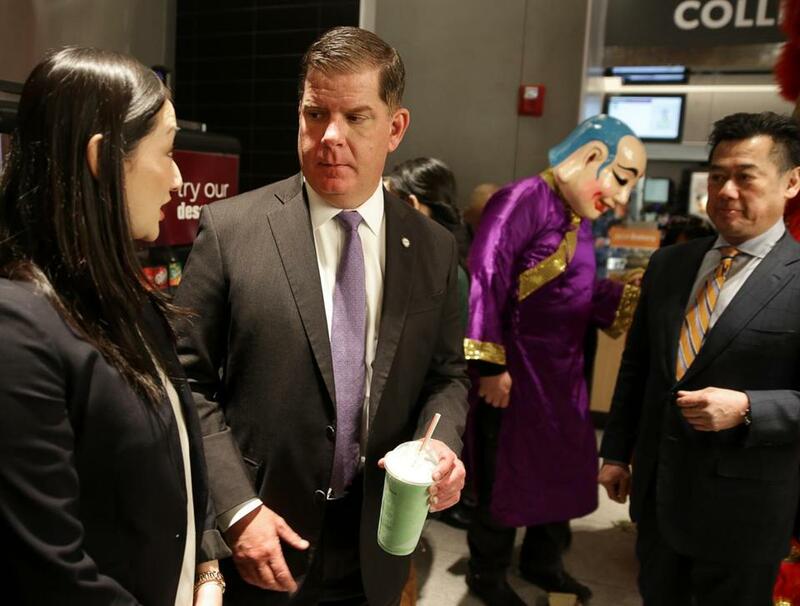 So, why would Mayor Marty Walsh show up at a downtown McDonald’s? Well, why not? An awful lot of his city does.